In 1959, Truman Capote, a popular writer for The New Yorker, learns about the horrific and senseless murder of a family of four in Holcomb, Kansas. Inspired by the story material, Capote and his partner, Harper Lee, travel to the town to research for an article. 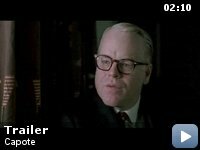 However, as Capote digs deeper into the story, he is inspired to expand the project into what would be his greatest work, In Cold Blood. 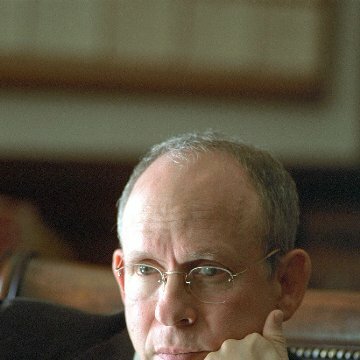 To that end, he arranges extensive interviews with the prisoners, especially with Perry Smith, a quiet and articulate man with a troubled history. As he works on his book, Capote feels some compassion for Perry which in part prompts him to help the prisoners to some degree. However, that feeling deeply conflicts with his need for closure for his book which only an execution can provide. That conflict and the mixed motives for both interviewer and subject make for a troubling experience that would produce an literary account that would redefine modern non-fiction. Michael J. Burg plays Capote's cousin, playwright Tennessee Williams. He has also played Capote himself in two other films: The Audrey Hepburn Story, and The Hoax. Anachronisms: A school bus shown in the background parked during the school scene shows an International hood and grille style from the late 1960s to early 1970s. 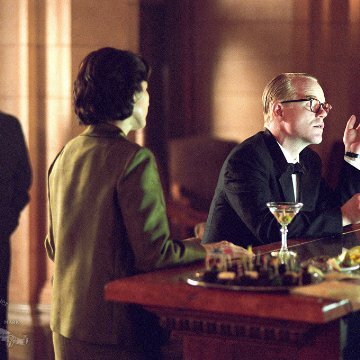 Mr. Hoffman, you are Truman Capote. The easiest role for an actor to play is a historical figure - we have no idea how Julius Caesar really sounded, how he moved his body, punctuated his speech, bit his lip, walked into a room, held his cigarette. The hardest role is the living, or recently deceased, celebrity whom we watched, heard, studied, mimicked and thought we understood. JFK, Martin Luther King, Ray Charles, and, above all, the inventor of self referential celebrity, Truman Capote (with apology to Andy Warhol and, of course, Noel Coward)..
After exploding to meteoric fame with his novella Breakfast at Tiffany's, Capote became the New York café society's darling, heir to Coward's gay-man-child-bon-vivant. He drank and held court with the best of New York, which just also happened to be the nexus of television in the early 60s. Before long Capote was the quintessential modern celebrity, famous for being famous. And he did it all before our eyes. Philip Seymour Hoffman does not so much play Capote as become him. 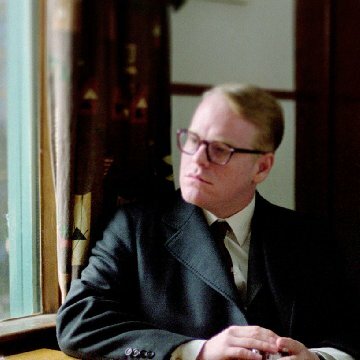 And not just in mannerism, no mean feat, but in personality, because we are convinced that Hoffman feels what Capote felt, cries over the lies, accepts his moral failings. 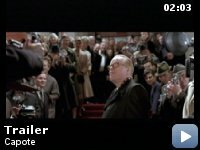 For a short story writer-raconteur from New Orleans, Capote found himself at the center of a nationally enthralling multiple homicide, facing the ultimate journalist's Faustian dilemma: if he perpetrates a lie for the sake of exposing the truth, is he ever worthy of redemption? Capote, in the end, concluded that he wasn't; he never wrote another book. He descended into drunkenness and died a lonely soul. This is not the stuff of Holly Golightly. I saw this picture at the Toronto Film Festival with Hoffman, Catherine Keener and director Bennett Miller in attendance. Though they had seen it many many times before, it was obvious even they were moved by it and by our reaction. As we stood and applauded them, we turned to one another, glowing in the realization that we had witnessed an amazing performance. We knew Truman Capote. We watched him live on television. Truman Capote was (we imagined) our friend. 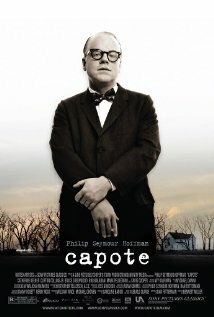 Mr. Hoffman, you are Truman Capote.